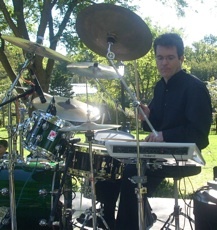 Mark has extensive experience as both a drummer and solo mallet synth performer (See MIDI Mallet Uno below). He has drummed for a wide variety of groups including Caribbean Steel bands, Big Bands, Jazz trios/Quartets, Funk Bands, Rock Bands and musicals. Mark’s back ground includes degrees from both University Of Miami (BME) and the University of Tennessee (MM in Jazz Studies). March 2015: a serious car accident and subsequent surgery on Mark’s leg kept him off the drum kit for a while. He had always wanted to learn to play bass as the drummer/bassist connection is so important. With the forced hiatus from drums the time was right to act on his long time desire. 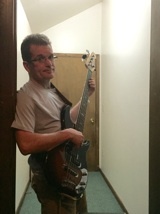 He bought an instrument, dove into bass forums and on line lessons. Nine months later, in January of 2016 he played his first gig with “Rounding Third” a local classic rock band. The band gigged most weekends and was a great way to learn fundamentals. UPDATE: October 6, 2018 was “Rounding 3rd’s” last gig. However “The Roustabouts” quickly offered to fill up Mark’s gig calendar. Click HERE for a list of gigs or check out the “Performances” link at the top of this page. 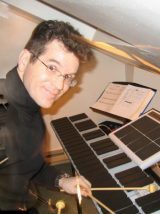 MIDI Mallet Uno is Mark’s solo mallet percussion project. 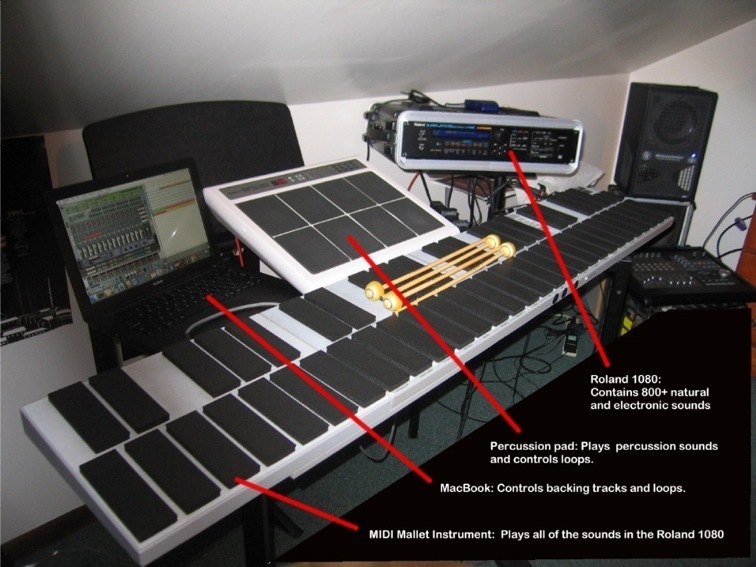 This exciting project features Mark on a mallet controller accessing a large array of acoustic and synth sounds. While Mark’s controller looks like an electric xylophone, it rarely sounds as such. It functions as a bass, piano, horn or synthesizer. Playing style from Jazz/Fusion to Latin to Rock. These sounds and textures are accompanied by triggered loops and backing tracks. The end result is a solo musician that sounds like a multitude of bands all sharing the same stage. “I don’t get it, what instrument is he playing” (overheard at a gig). Musicians and non musicians alike may look at the picture to the left and think, “Ummm…what”? Check out the video and it all makes sense.